Quality assurance (QA) can be thought of as the practice of avoiding defects or mistakes, but we prefer this definition: the maintenance of a desired level of quality in a service or product, especially by means of attention to every stage of the process of delivery or production. 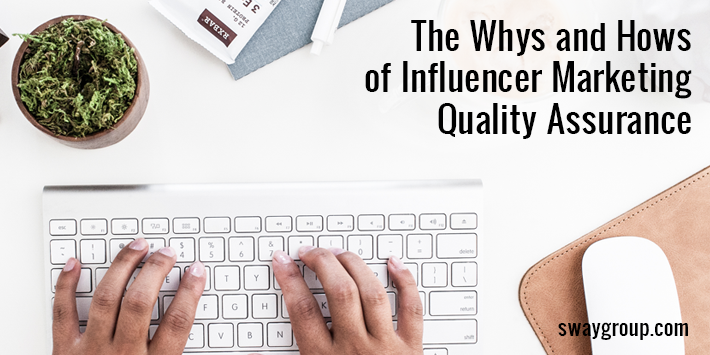 In other words, a great QA process should ensure a great outcome — and that’s why QA plays such a critical role in each of our influencer marketing campaigns. At Sway Group, we’ve spent years establishing best practices for verifying quality and FTC compliance for all our influencer strategies, and we want to share that knowledge with you. In our latest e-book, we’ve included the information you need to develop your own influencer QA approach to cover everything from brand messaging to proper disclosure language. You need to be sure your campaign is firing on all cylinders, from the graphics and storyline to brand link and asset inclusion. A strong QA process not only reduces confusion about campaign goals and expectations, it ensures your influencer content complies with the current Federal Trade Commission’s (FTC) endorsement guides. We are so invested in quality assurance at Sway Group, we have a dedicated team who personally reviews every single piece of content at various stages in each client’s program. Your QA process might look different, depending on resources and timelines, and that’s why we’ve outlined the basics for building a flexible system that works for your environment. By implementing QA into your influencer marketing strategies, you’ll have the measurement tools you need to evaluate your current campaigns — and the ability to refine and improve your future content strategies. Interested in learning more about Sway? Contact us to get more details about influencer marketing QA or set up a free strategy consultation.